Home > Reviews > Modern > Meng Kit No.TS006 - T-90 Russian Main Battle Tank. Stock Number and Description Meng Kit No. TS006 - T-90 Russian Main Battle Tank. The Zvezda kit has now been joined by another kit of the same variant, the T-90A Model 1999, by Meng Models. This kit is interesting in that it was designed with the cooperation of Aleksey Khlopotov, a Russian armor historian and writer. While Aleksey is a modeler and analyst of Russian armor, what he rarely notes is that he once worked for the Nizhniy Tagil Technical Institute for Metallurgical Research (NTIMI) which was a research arm of the UVZ tank plant. As they say in the underworld, consider Aleksey “connected”. I do not know how long he had been working on this project, but I do know he produced a rather critical assessment of the Zvezda kit when it was released and panned it for a number of errors; for the moment let us note that the errors were not something 99.99% of Western modelers would ever have caught. So how is this kit? In one word, stunning. The amount of detail that Meng has given this kit is truly incredible. It provides the Russian armor modeler with a kit of similar detail level to the DML Tiger I and Panzer III/Sturm III kits with separate torsion bars and detailed shock absorbers among other nice touches. It also provides a complete V-92S2 1000 HP diesel engine complete with the new exhaust nozzle with thermal shrouding and also the curious “Sil’fon” device: this draws cold air from the air cleaner to suppress the heat signature of the tank. There are 43 steps in the construction of this kit, about the same as those used on the Xact T-80U kit. One thing that Meng has done and few others attempt is to provide aids to assemble the kit. I don’t see it mentioned in the directions but etched brass part C is a wheel stencil for painting the road wheels prior to installation as it masks off the tire from the wheel center. Most of the kit assembles in the fashion most armor modelers expect, starting with the lower hull and suspension. There are holes that need to be drilled in some spots so it will require following the directions closely. If you have assembled either the Zvezda T-90A or Xact T-80U then little in the parts breakdown will be a surprise. This kit does provide the best Soviet-style lever action shock absorbers (parts E-7, E-9, B-14, B-22and they even may be permitted to operate if care is used on assembly. 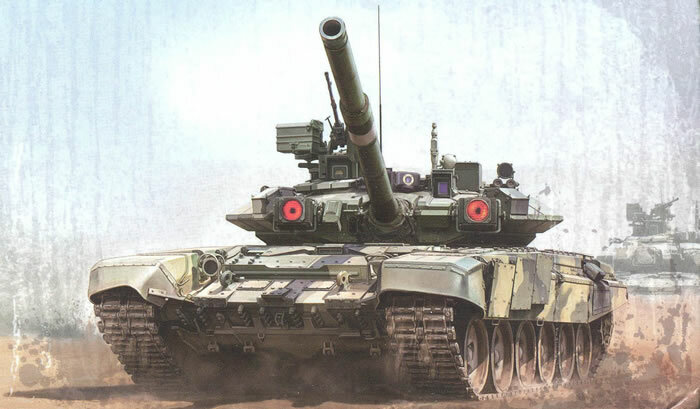 As this is a T-90 there are six of them vice four on older tanks. The V-92S2 is a nice kit on its own and consists of some 39 parts to include etched brass covers. A firewall is included but no radiator, oil cooler, transmission or fan are provided for the engine compartment. The upper hull assembly is as before similar to the other two kits mentioned. But the entire fender tips are slide molded and one piece styrene affairs, a nice touch. A styrene spring and fillet finish off each one. The driver’s hatch and the area called the “decolletage” by the Russians (the area in front of the driver’s viewers) is a separate part that attaches to the hull top. The rear radiator air exhaust assembly (part B-27) is the most accurate rendering of this assembly I have seen yet. In Step 19 note that the kit comes with two engine decks and the proper one to use here is N-7. The deflector flaps for the rear air exhausts are also included (parts F-12). The unditching log and tow cables are pretty conventional; the former needs distressing with a razor saw scraped along it, and the latter may be better using twisted steel or brass wire. The tank like other T-72/T-90 models uses the “demand” fuel access to the two auxiliary tanks on the rear and provides the correct plumbing (parts C-32/C-34) for them. The main gun consists of 8 parts in styrene - no brass trim rings - but does come with the correct cutback behind the muzzle protector (part A-73) for the mounting of an MRS (UUI in Russian) mirror device; however this tank does not have that system fitted. The muzzle is also flattened on one side, so it is a good match for the 2A46M-5 gun fitted to this tank type. Also like the other two kits, the model comes with the inner hatch details for the commander’s and gunner’s sights and controls. It took comes with the complete 1EhTs29 commander’s weapon station with remote controlled NVPT machine gun, but unlike the early Zvezda kits all of the bits are there! One surprise is the tiny amount of etched brass in this kit - only 9 parts if one ignores the wheel stencil. But it really doesn’t need them and the molding of the parts is crisp and quite good. As noted source is indicated as Aleksey Khlopotov (“Gur Khan”) and a very nice instruction book is provided with history and information in English, Russian, Chinese and Japanese. Finishing instructions and decals are provided for six different tanks: two from the 27th Guards Motorized Rifle Brigade, Victory Parade, Moscow May 2011 (overall dark green with Guards badges and bort numbers); one for the 19th Motorized Rifle Brigade, North Caucasus Military District (tricolor with bort numbers and armored markings); and three more tanks from the 27th Guards Motorized Rifle Brigade, Victory Parade, Moscow May 2008 (tricolor with Guards badges and bort numbers). A number jungle of bort (turret or side) numbers is included along with four different subunit markings on a Cartograf decal sheet. Overall other than the overwrought tracks this is an excellent kit, but overall it will be up to the modeler how much he really wants that last bit of accuracy. If this kit is a 10 (and it really is!) the Zvezda one is about an 8-8.5 – and half the price.